UGC NET Dec Application Form Correction 2018 – National Testing Agency (NTA) has released new notice on its website, ntanet.nic.in regarding UGC NET Dec Application Form Correction 2018. The candidates were too confused about the whose photograph will be selected and whose will be rejected. So this confusion has been removed by the notice of NTA now. The image of notice is provided below on the page. Now the candidates can make changes in only photograph and signature till October 30, 2018. But all the field can be changed until October 14, 2018. Before or till the last date of Application Form Correction candidate can do the correction in their application form. For making the corrections the candidates have to pay the correction charges. From this page, the candidate will get full information regarding UGC NET Dec Application Form Correction 2018. Latest: The UGC NET Dec Application Form Correction 2018 has been extended till October 30, 2018. Scroll down to know the reson behind this. Candidate needs to correct all the incorrect details mentioned in the application within the given time duration only. Only by using Online mode candidate will be able to edit or correct the application form. Only those candidates who registered themselves before the last date are able to correct the form. 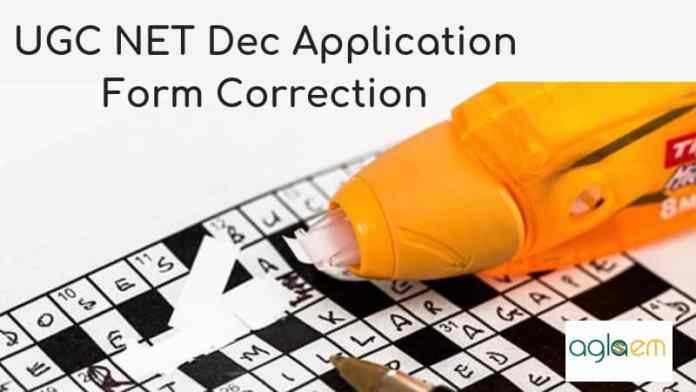 Application Form Correction: Click here to Correct UGC NET Dec Application Form. All the fields are editable in application form till October 14, 2018. And after this, till October 30, 2018 candidates will be able to change only two fields i.e. photograph and signature as per the new notice of NTA. Is There Any Fee For UGC NET Dec Application Form Correction 2018? In the NTA’s notice, it has clearly mentioned that for making changes in the application form the candidates have to pay a certain amount through the credit/debit card or through e-challan generated during the online correction. However, the amount has not been mentioned their, candidates will get it to know while correcting the form. 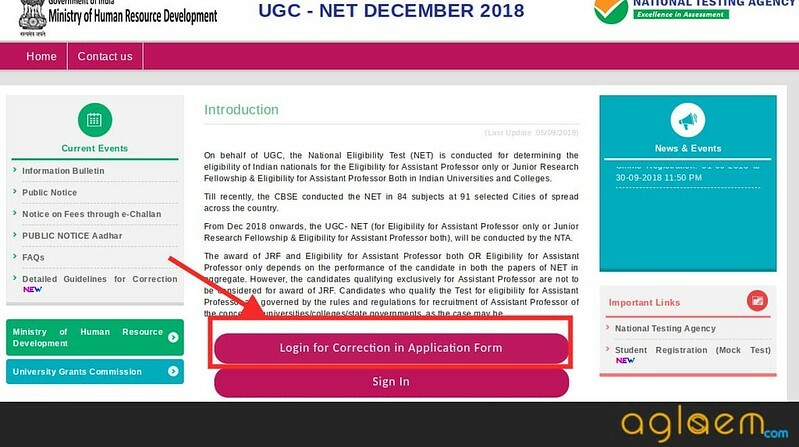 How To Correct UGC NET Dec Application Form 2018? The candidates who have registered and paid the fee for UGC NET Dec 2018 before or till the last date those candidates will only be able to do the UGC NET Application Form Correction 2018. Candidate can follow the given below steps for doing the correction in UGC NET Dec Application Form. After clicking at the above-provided link candidate will be redirected to the login page. Mention all the asked login details such as Application Number, Password, Security Pin etc. Thereafter, Application Form page will appear which will be already has been filled by you. From that application form page, you can reread all the mentioned details and can edit or do the corrections of yours mentioned particulars. After doing the correction reread all the mentioned details and then click on the submit button. After editing the application form page when the candidate will click on the submit button it may be possible that one application form confirmation page open. Candidate needs to read all the mentioned information on that page and if the candidate will agree with all the mentioned details on that page then click on the ok button. After confirming the confirmation page candidate’s application form correction will be done successfully and will be submitted. Which Particulars Corrections Are Allowed In UGC NET Dec Application Form 2018? NTA has clearly mentioned that “Changes are allowed in all the fields“. Hence candidates can change any field. But there is only one condition that the candidates are allowed to make the changes in application form only once. How Many Times Correction Are Allowed In The UGC NET Dec Application Form 2018? NTA is opening the correction window for one time. In the given time frame the candidates can alter the changes only one time. This one-time facility has been allowed by seeing the hardships of the candidates. The candidates should note that after this period of time they will not be allowed to make any changes in the application form. Discrepancy Related Photograph Which Could Harm Candidature? After scrutinizing the application form, NTA has noticed that very must discrepancy related photograph and signature in the application form. Here is the list of discrepancies which can harm your candidature. Drawing a line or fancy circle instead of a signature. If the above link doesn’t work then click here to download the file.